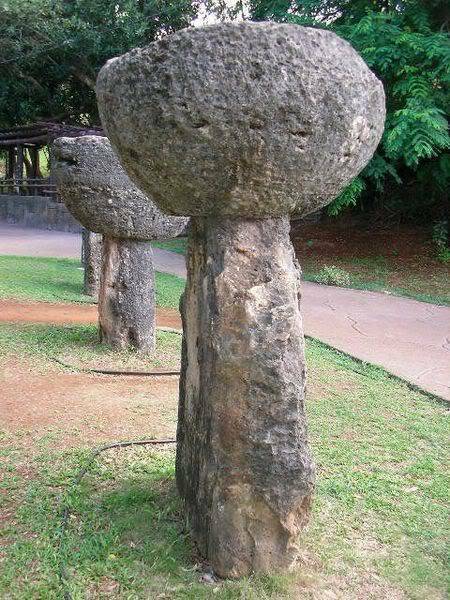 A latte stone, or simply latte (also latde), is the term for a pillar (Chamorro language: haligi) capped by a hemispherical stone capital (tasa) with the flat side facing up. Used as building supports by the ancient Chamorro people, they are found throughout most of the Mariana Islands. In modern times, the latte stone is seen as a sign of Chamorro identity and is used in many different contexts. This image, which was originally posted to Flickr, was reviewed on 15 May 2008(2008-05-15) by the administrator or trusted user BanyanTree, who confirmed that it was available on Flickr under the above license on that date.